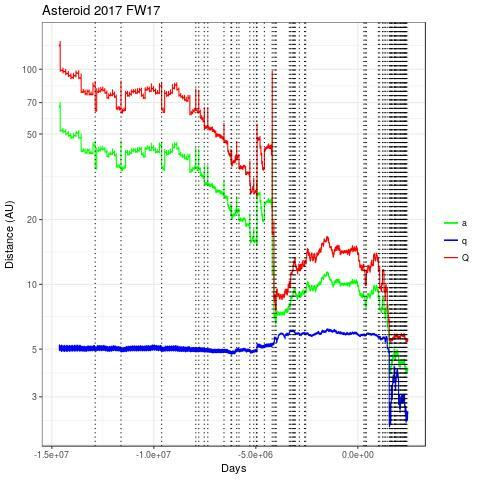 astro: Asteroid 2017 FW17 - an extinct comet? 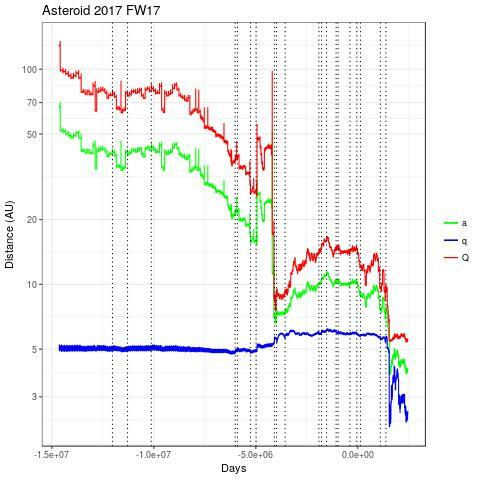 Asteroid 2017 FW17 - an extinct comet? 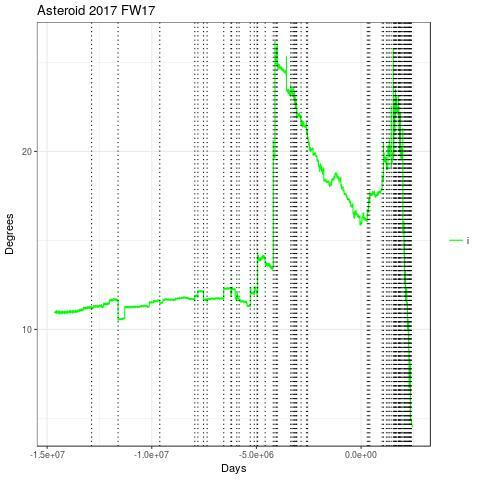 Asteroid 2017 FW17 was first observed at Pan-STARRS 1, Haleakala on 2017-03-18. The orbit condition code is 8 so it is extremely uncertain. The object is interesting because it might have a cometary origin although this is difficult to say given the uncertainty. 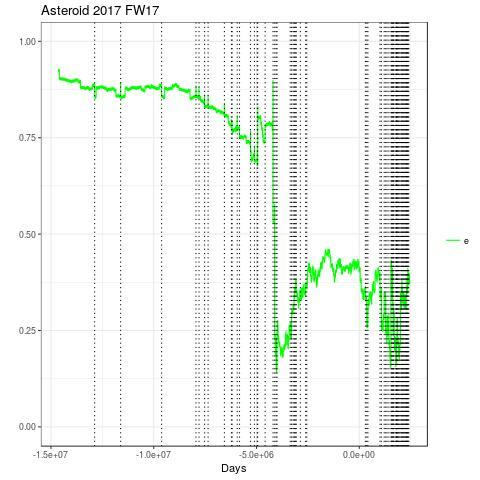 I generated 100 clones with orbit parameters average and 1-sigma as shown above and simulated what happened in the last 10^8 days. thanks to Tony Dunn for a comment that he sent me: if its current nominal orbit is correct, this asteroid is a Hilda with a 3:2 resonance with Jupiter. But as Tony run it forwards and backwards, it leaves the 3:2 resonance within a few hundred years. Tony has a online simulator that shows the short term Hilda behaviour . 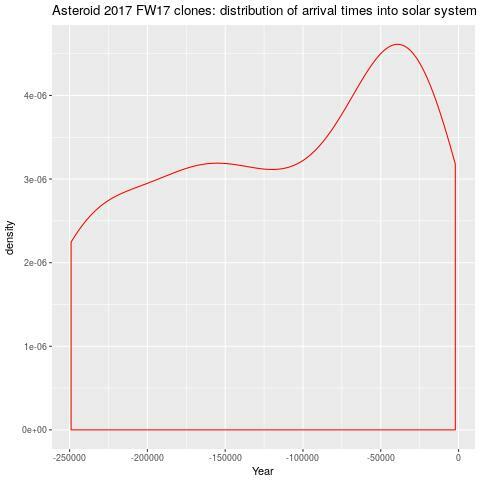 The result of the simulation is that 47 out of 100 clones might have arrived in the solar system from a distance greater than 100 AU. Their arrival time is very much uncertain. Going back in the past, the first arrival was in year 2075 B.C. while the last arrival was in year 249000 B.C. Every clone has its own "orbital history" and different clones have completely different "histories". While there is no reason to focus the attention on a specific clone, one might choose a clone just to have an idea of the general macroscopic behaviour. 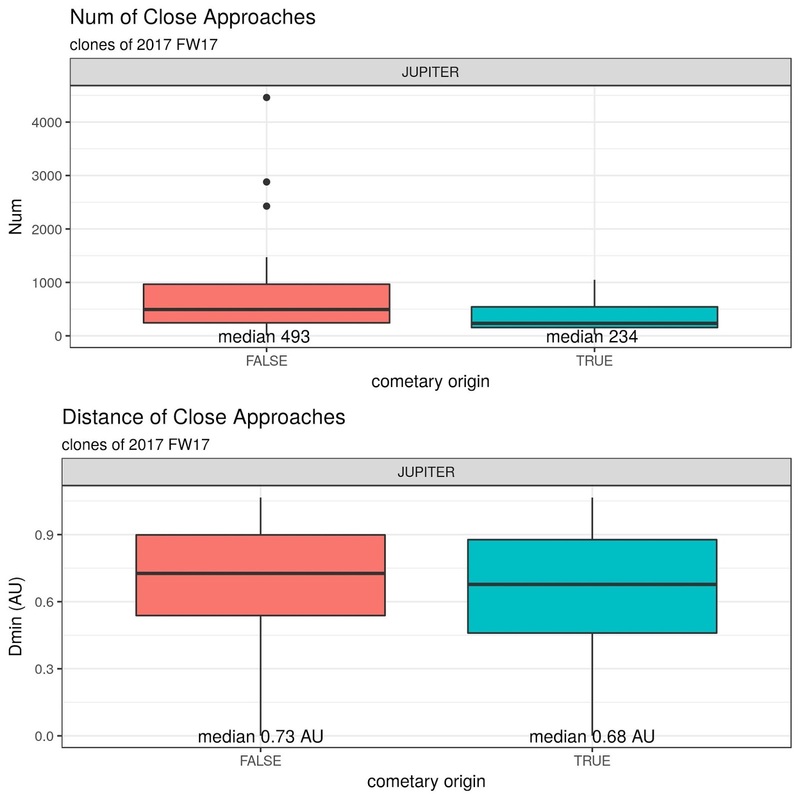 One can also try to capture the effect of the close encounters with the major planets: the details are not necessarily true but the overall pattern might be reasonable. Thus, let's see the history of a clone that arrived in the solar system about 45000 Years B.C. 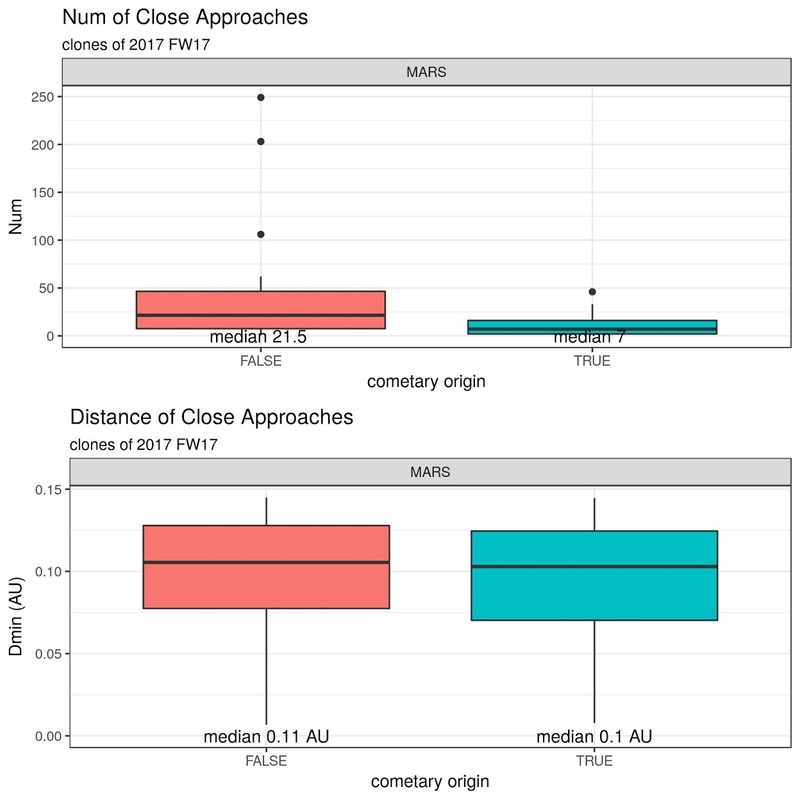 This is a plot (made with package ggplot of the programming environment R that was also used to calculate the above tables) showing semi-major axis, perhelium and aphelium distance as a function of time. 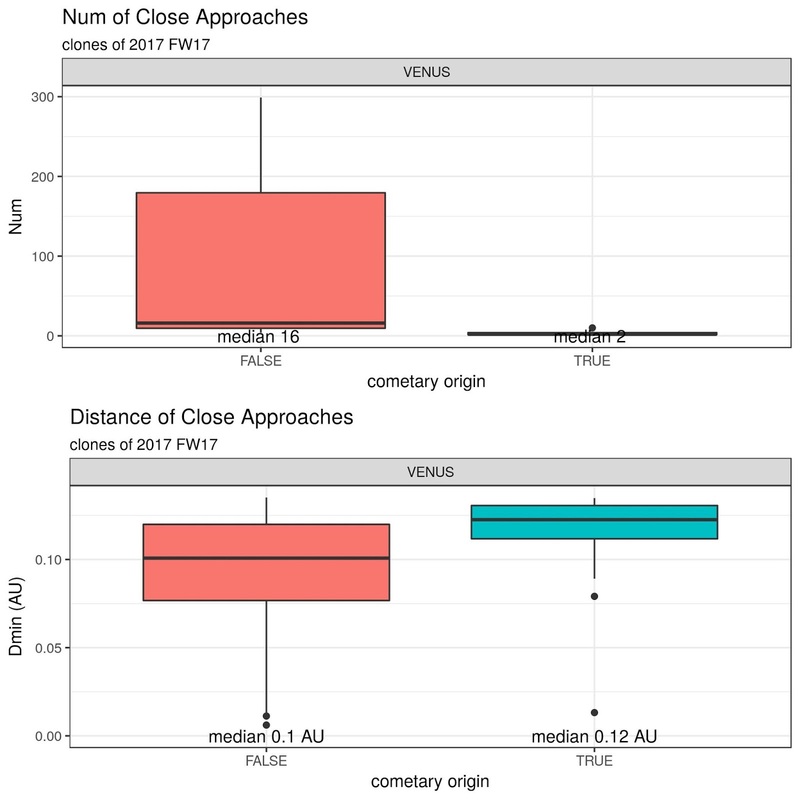 The close encounter with Uranus is shown as a vertical dotted line. 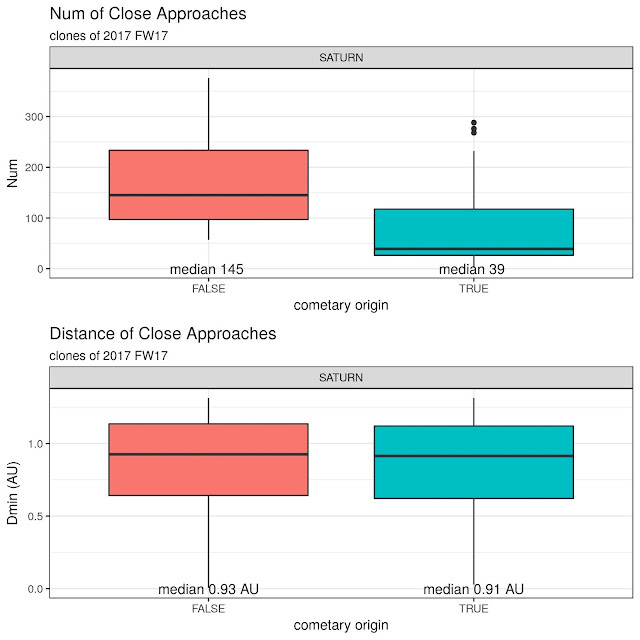 This second plot below shows the same thing but this time the vertical dotted lines are associated to the Saturn close encounters. 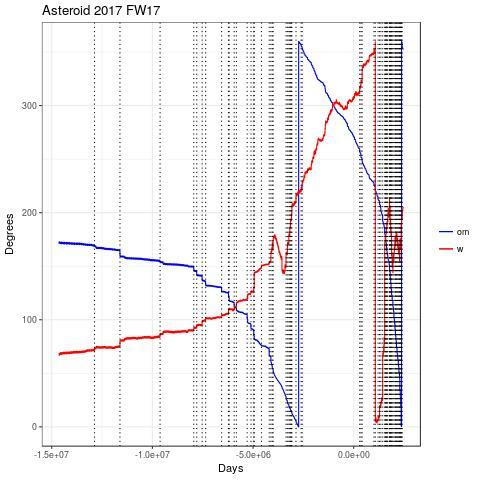 As said above, there is no reason to focus on a specific clone besides the possibility to look in a graphical form to one of the possible asteroid "histories". More in general, we can consider that any given clone had multiple encounters with any given planet, so we can make an average of the these encounters (we can focus first of all on number_of_encounters and encounter distance). 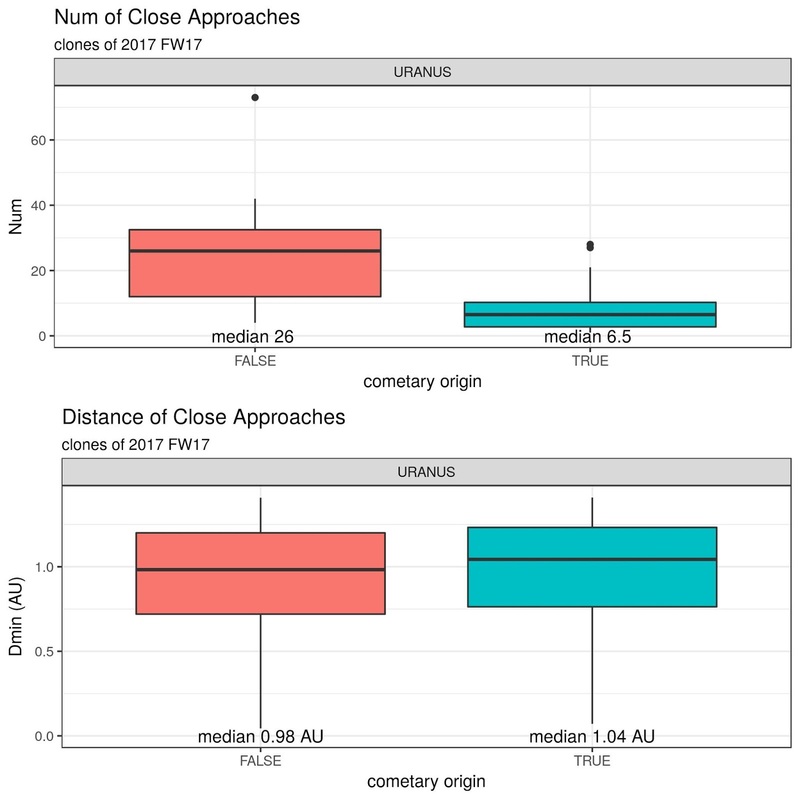 Even better: we can make a box-plot (showing min, max, median, 1st and 3rd percentile) to have an idea of the distribution. 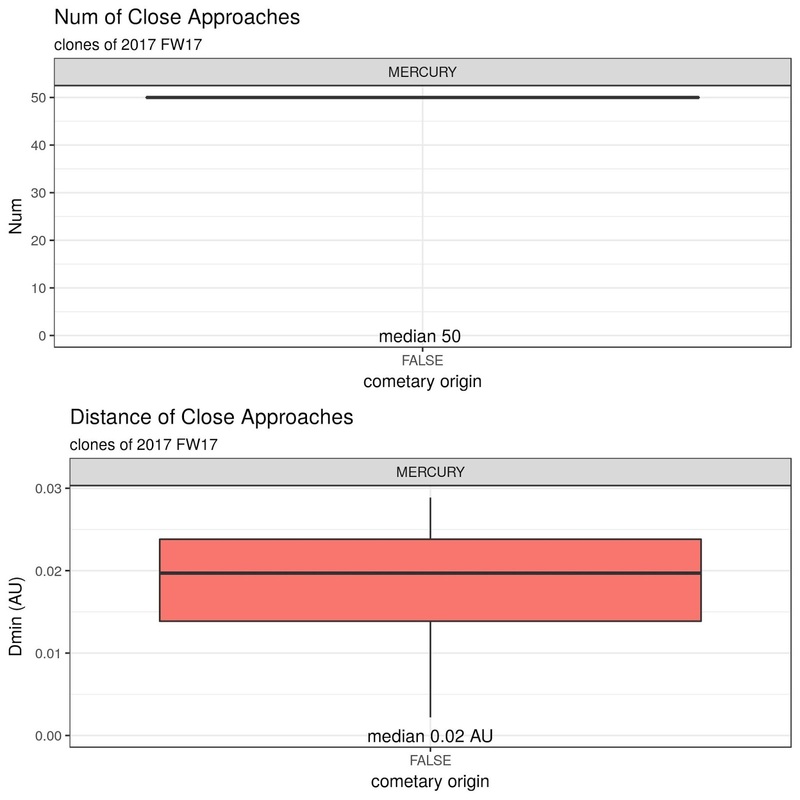 In some special cases (like the case of encounters with planet Mercury that you see below), there is only one clone that contributes: thus, the boxplot of the numer of encounters is "flat" and equal to the number of encounters of this clone. In the plots below, it is also possible to compare the clones suspected to be comets with the normal asteroid clones: look at "cometary-origin".